Remember those cartoons where the main character discovers a garden oasis in the middle of the desert? That’s what it’s like arriving at the JW Marriott Desert Ridge and Spa. As you step into the lobby, you’re greeted by a large water fountain - situated front and center - along with floor-to-ceiling windows with views of the desert landscape and the many water features that await you. My kids were overly eager to start discovering. Thankfully, a staff member brought out a small, plastic ball for later pool play and Griffin Kids bracelets that could be later exchanged for a special, poolside treat. It was just enough to distract my boys and allow me to finish the check-in process. After a quick stop at the flavored water station and our spacious room, I couldn’t hold the kids back any longer. We were pool-bound. My children weren’t quite sure where to begin because there are so many options. The resort boasts five pools, a lazy river, a waterslide, and a whirlpool. Because it was 117 degrees (really!) out when we visited, we skipped the whirlpool and spent our time in the other pools. The Wildfire Outdoor Pool includes a fun tower with sprinkling water that the kids enjoyed running through; later in the evening, the tower included a flame feature which they found very exciting. On our first day, my kids were most captivated by the lazy river and serpentine water slide. We spent hours floating around on the provided tubes and then stopping in some of the smaller areas without a current to swim. The waterslide is attached to the lazy river, so we were able to enjoy the slide as we floated by. The kids’ club staff also had activities scheduled near the lazy river several times each day. My boys loved the water bowling, which allowed them to get their hands on water guns while trying to knock down plastic bowling pins. Because of the record-breaking heat, the staff modified the games to keep kids in the water as much as possible. The consideration regarding the heat was much appreciated by this Midwestern family. Staff members encouraged guests to drape wet towels over the pool’s edge to get in without having to put bare feet on the hot concrete. Ice water was readily available around the pool, and servers were happy to bring pitchers, as needed. KidTripster Tip: The pools at this resort are cooled during hot weather. Surprisingly, that isn’t the case at all Phoenix-Scottsdale resorts. On our second day, we had the ultimate in luxury experiences with a private cabana at the Griffin Bay Pool. The cabana experience included a misting fan, covered seating area, chaise loungers and umbrellas, cabana attendant and waiter, refrigerator (with bottled and flavored water), big screen television, and tray of goodies including fresh baked cookies, trail mix, and fresh fruit. The staff was exceptional and made sure that we had everything that we needed at all times. Our waiter went above and beyond, delivering chicken strips to the pool’s edge and having the pastry chef make extra cookies when one brother ate more than his share. The cabanas offered real relief from the Arizona heat; with the canvas doors closed and the misting fan running, it felt downright cool. And remember those Griffin Kids bracelets that the boys were given at check-in? Our waiter went to retrieve the treats for the kids only to find out they were out of the popsicles normally given. Instead, he had the bartender create wonderful fruit smoothies and then delivered them poolside. Honestly, the JW Marriott Desert Ridge may have spoiled all future hotel pools for my family! KidTripster Tip: Advance reservations are recommended for the cabanas; however if there’s availability, the staff will accommodate same-day requests. For the level of service and amenities that you receive, I found the price to be pretty reasonable. Cost: $250/day. Family Escape is an area at the resort that allows for both supervised childcare and open family time. In the morning, kids (ages 4 to 12) can attend kids’ camp which includes crafts, games, activities, and adventures around the resort grounds. Cost: First child $45; Additional child $40; add an extra hour plus lunch for an additional $15/child. After the camp ends, check out the crafting, games, and family activities set up both inside and outside of the Family Escape area. My family particularly enjoyed the board games and oversized Connect Four. On Friday and Saturday nights, Family Escape offers seasonally-themed parties with dinner at an on-site restaurant, crafts, movies, and other fun activities. You’ll see kids participating in their pajamas, adding to the fun and relaxed vibe. Cost: $55/child, which includes dinner. You’ll also find a family concierge who is able to answer any questions that you may have or assist in setting up other fun options for your group. The JW Marriott Desert Ridge doesn’t disappoint with outdoor activities. 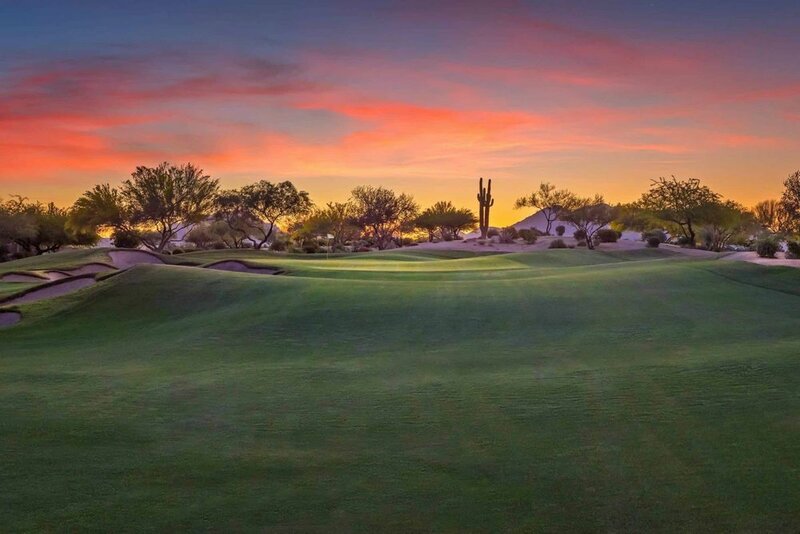 For those who want to hit the links, the Wildfire Golf Club features two championship golf courses designed by Arnold Palmer and Nick Faldo. A junior golf program and lessons are available, and kids (under 4) golf for free. Families can check out pickle ball, a sport that combines aspects of tennis, badminton, and ping pong. Or reserve some time on the lighted tennis courts in the evening when it’s a bit cooler. Your resort fee also includes bike rentals for exploring the property. If you manage to score some adult time on your trip, the Revive Spa has a menu of treatments, while the fitness center sports cardiovascular equipment, free weights, and fitness classes. Know that the area is only available for those over the age of 18. The JW Marriott Desert Ridge is one of the larger resorts in the Phoenix area and offers a wide variety of choices including traditional rooms and suites. My family stayed in a large, junior suite with a king bed and sofa bed. Because I have three children, the resort staff also brought in a rollaway bed, so no one woke up in the middle of the night yelling about being touched by a brother. Our room included a large balcony, kitchenette with coffee maker and espresso machine, and large bathroom with a walk-in shower and tub. My kids especially liked the two huge TVs, and the whole family enjoyed the free movies that were part of the resort package. Rates start at $299/night during low season (summer) and $489/night during high season (winter), plus an additional resort fee of $35/night. You won’t go hungry at the JW Marriott Desert Ridge. The resort offers a variety of restaurants, as well as poolside dining, room service, and a free shuttle to the nearby outdoor mall with a multitude of other options. We ate more than one meal at the pool because it was hard to drag my kids out of the water and found the options to be reasonably priced and filling. The chicken tenders and hamburgers were both expected fare but very good, while the chicken quesadilla was one of the better ones that this picky mom has had in recent memory. On our last morning, we opted for a room service breakfast and ended up with more food than we could possibly eat! However, our favorite dining experience was dinner at Stonegrill. Located in the main building of the resort, this kid-friendly restaurant features Southwest cuisine and great hospitality. The kids’ menu offers traditional fare as well as some unexpected, healthier options. My oldest son gravitated to the New York strip steak while the adults chose grilled chicken under a brick with pink peppercorn sauce and green chili cornbread stuffing and cola-braised short ribs with Brussel sprouts and sweet potatoes. All three Southwestern interpretations of traditional American dishes were incredible. The star of the night, though, was the cinnamon churros with a chipotle chocolate sauce, an orange cajeta sauce, and ice cream. Each element alone was spectacular; but when combined, that dessert was worth the trip to Phoenix! The JW Marriott Desert Ridge is located 22 miles from the Phoenix Sky Harbor International Airport. The hotel doesn’t provide shuttle service, but there are several companies that work with the resort; advance reservations are required. There’s a Hertz rental car counter on the property, so you can rent a car once you have arrived or rent a car at the airport and return it at the resort. There’s a daily resort parking fee, so if you don’t need a car for your entire trip, you possibly could save some money by booking a shorter rental. Former journalist Jamie Farber lives in West Michigan with her husband and three sons. Her English degree has somehow led her to a career planning Disney vacations with Mickey Travels. In her spare time, she enjoys planning her family's many trips around the U.S. and the Caribbean.